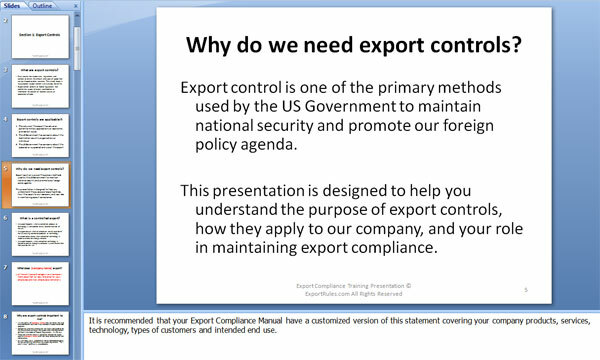 The Sample Export Training Presentation is a fill-in-the-blank style slide show designed for exporters that are regulated by the US State Department (ITAR) and the US Department of Commerce (EAR). It will save you thousands of dollars over developing your own training seminar. It will meet your legal requirement for educating your employees. Exporters are required to educate their employees, but you don’t have to do it from scratch. If you export controlled products or technology, you’re legally obligated to provide training and education for your employees. If you’re anything like the thousands of exporters that visit this site, that means researching, developing and writing a custom slide show for your company’s employees. 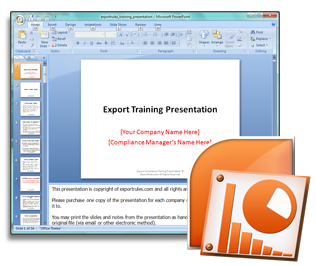 For you we’ve developed the Sample Export Training Presentation – a fill-in-the-blank slide show that you can customize and use in less than ten minutes. The typical compliance presentation takes more than 100 paid hours for an employee to assemble and often contains critical errors and omissions. When we created the Sample Export Training Presentation our goal was to combine the best parts from the presentations we give into a simple, easy to customize package that you can use for training. In addition to the slides, we’ve added plenty of additional notes for the speaker containing definitions, real-world examples, helpful hints, and specific citations. Our goal is to provide a product that can be presented by an inexperienced compliance officer as easily as an industry veteran. The presentation contains sections on both the Export Administration Regulations (EAR) and the International Traffic in Arms Regulations (ITAR). Either of these sections can be easily removed to fit your company’s needs. Why do we need export controls? 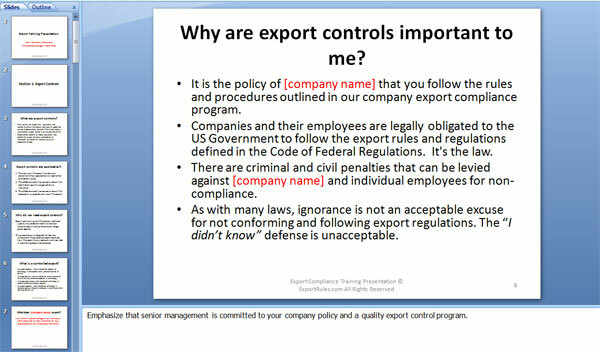 Why are export controls important to me? Our goal is to help the personal and business exporters that fuel our national economy. With that in mind, if you’re not completely satisfied with this product for any reason tell us and we’ll work with you directly to resolve the issue. This product is available for download only as a Microsoft PowerPoint (.ppt) file. The download includes a plain-text (.txt) and Adobe PDF (.pdf) version of the slides. This product requires a program that can read and access those file types. Before writing this presentation, I had the opportunity to sit down with a high-ranking export compliance auditor and I asked him to list everything he would want his own son to know about export compliance before developing his own program. Four hours later, I sat in the parking lot of his office furiously scribbling notes and listing every point he had made. That conversation is the cornerstone of every presentation I’ve given since, and is the basis for this product.